After breakfast transfer to the port of Piraeus to catch the local ferry to Mykonos. Arrival at the famous island and transfer to your hotel. Rest of the day at leisure. Breakfast and morning at leisure until the time to transfer to the port of Mykonos to catch the local high-speed ferry to Santorini. Arrival in Santorini and transfer to your hotel. Rest of the day at leisure. Breakfast and morning at leisure until the time to transfer to Santorini airport for your departure flight. 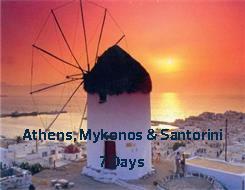 Accommodation on BB, 2 nights in Athens, 2 nights in Mykonos & 2 nights in Santorini. Ferry tickets Piraeus - Mykonos regular ferry and Mykonos Santorini high-speed ferry, economy class.